When you need an SUV with a little bit of attitude and a rebel spirit that doesn't shy away from an adventure, the automakers at Jeep have the perfect off-road vehicle the 2016 Renegade. This subcompact SUV comes with all the powertrain and performance of a regular size Jeep packed into a smaller and versatile car-like body that embraces the rough terrain as much as a smooth highway. If a Jeep is what you are after, there may be no better place to visit than Sulphur Springs CDJR in Sulphur Springs, TX, where our dealership remains one of the best places to buy a car in the entire area. Our expert team of representatives are ready and waiting to get you into the 2016 Jeep Renegade today! Compact SUVs have been a popular segment over the last half decade as drivers to continue to want the versatility and power of a larger vehicle, but with the responsiveness and handling of a smaller one. The 2016 Renegade produces a smooth and clean ride with its upgraded sports suspension, and the SUV eats put bumps and potholes for breakfast. Underneath the hood sits two available engine options: the first, base level model, offers a turbocharged 1.4-liter four cylinder options with 160 horsepower and 184 pound-feet of torque on a six-speed manual transmission. The next engine is a 2.4-liter four-cylinder model with a nine-speed automatic transmission available in a front-wheel or all-wheel drive version that produces 180 horsepower and 175 lb-ft of torque--a robust and reliable option for those drivers looking to hit the back roads and unpaved highways. 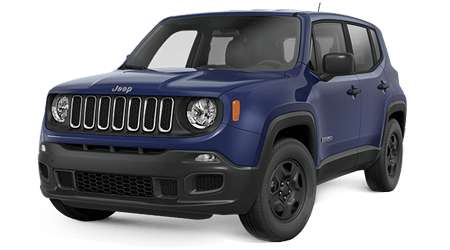 The five-passenger Renegade is available in four trim levels beginning with the Sport, Latitude, Limited and Trailhawk. Base level amenities include 16-inch wheels, power locks and windows, keyless entry, cloth upholstery and a four-speaker audio system among other things. The upgraded trims add in fog lights, roof rails, a dual exhaust tip, a leather-wrapped steering wheel and heated front seats, to go along with Uconnet 5-inch and larger touchscreen system that let's drivers connect their smartphones into the SUVs interface. Interior wise, the cabin provides ample leg and head room for both the front and back passengers and offers up to 50.8 cubic feet of cargo space when the back seats are folded down. Overall the 2016 Renegade offers an intimate experience with a sleek design and excellent comfort levels in all areas. There are plenty of reasons to purchase a Jeep Renegade and versatility clocks in as one of the primary reasons. A full-size crossover SUV may not be the right choice for every car buyer, and for those that would love to experience the all-around excellence of the Jeep brand name, without opting for a larger version, the 2016 Renegade is the perfect option. The compact SUV provides a truly unique SUV option and those free spirits who want to stand out wherever they go, this is the vehicle to see. At Sulphur Springs CDJR we proudly serve patrons from the Tyler, and Greenville areas with a team of knowledgeable and friendly sales people who want nothing more than to get you a great deal. Visit us at 1505 Industrial Drive West, Sulphur Springs, TX 75482 to schedule a test drive in the 2016 Renegade today! We look forward to serving you.